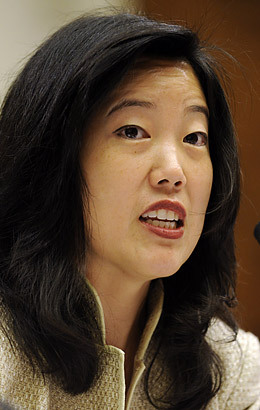 StudentsFirst was founded and is led by former DC chancellor Michelle Rhee and funded primarily by hedge fund operators, the Walton Foundation and Wall St. financiers. She claims two million members, hyperbolic assertions that are oft repeated by credulous reporters, despite the fact that many of these "followers" landed on her mailing list by mistake, after signing one of the organization's deceptive petitions promoted by for-profit sites like Change.org. The New York chapter of the organization, StudentsFirst NY, run by Jenny Sedlis, formerly of Success Charter chain, makes similarly inflated claims of 150,000 members. Exaggerated assertions seem endemic to the organization. In recent testimony, SF organizer Tenicka Boyd maintained the organization has "talked to over 300,000 New Yorkers" to gauge their support for the corporate reform agenda of Common Core and more high-stakes testing. Despite any evidence of real grassroots support, these organizations do have a substantial budget and paid staff here in New York and across the nation, making it somewhat surprising that when they send out a message, the response is so overwhelmingly negative. We are thankful for higher standards for our kids through #CommonCore. @leoniehaimson @StudentsFirstNY such is the way of the world in the US & the UK. Those countries that do not prescribe do so much better! We are thankful for #teachers who want to be held accountable for their work. RT if you're thankful, too. @StudentsFirstNY We are thankful when teachers are allowed to teach. @StudentsFirstNY Give it up! It's Thanksgiving for goodness sake! Can't you leave teachers alone for one day!?!
. @StudentsFirstNY That was deeply distasteful and unnecessary. Put the phone down. Go be with family. Morons. RT @StudentsFirstNY: We are thankful for #teachers who want to be held accountable for their work. RT if you're thankful, too. We're thankful for school choice - it empowers parents to take an active role in their child's education. RT if you're thankful, too. @StudentsFirstNY As long as they choose the Common Core and my private interns making decisions, they can choose what they like. @StudentsFirstNY You can't take off one day from being disgraceful? @StudentsFirstNY school choice = new segregation. Parents should not need this to take an active role in their child's education. We are thankful for a robust #teacher evaluation system that will hold #educators accountable and allow children to learn more. @StudentsFirstNY Based on what research ya hacks? @StudentsFirstNY you must not have read how the evaluation system works, huh? Art teachers being evaluated by ELA scores does what, exactly? @StudentsFirstNY That might be the most ridiculous tweet in the history of Twitter. Just stop! It's pathetic. Just enjoy Thanksgiving. @StudentsFirstNY even on Thanksgiving? Have you no shame? Teachers work hard all year for this kind of "appreciation"? For shame. @StudentsFirstNY, I'm an 18-year veteran working w/at-risk kids & b/c I choose that work I'm labeled "ineffective." APPR doesn't help kids. @StudentsFirstNY why do you believe we are not ROBUST and already ACCOUNTABLE to those who really count...the students! We are thankful to @JohnKingNYSED for not backing down on #CommonCore. He wants your children to be college and career ready. @StudentsFirstNY @JohnKingNYSED I will be thankful when @StudentsFirstNY realizes it is Thanksgiving and stops tweeting. In case you are not sick from all the great food today, check out the distasteful tweets of @StudentsFirstNY today. Ridiculous. We are thankful for the possibility of all children graduating college and/or career ready. RT if you're thankful, too. Ugh. @StudentsFirstNY Let us all note that there are exactly zero retweets on this so far. For this I'm very thankful. @StudentsFirstNY I'd be more thankful if you'd stop these embarrassing tweets. @StudentsFirstNY Now it's college "and/or" career? Get your talking points straight. @mrobmsu @KarenLewisCTU I'd be thankful if @studentsfirstny was properly medicated. @StudentsFirst Sure you don't want to serve a backhanded compliment to teachers like @StudentsFirstNY ? Be careful: there's no way you can ever exceed the cliche and buzzword production of the reform-bots. It's an endlessly repeating loop of lies and self-deception. It is sinful that Ms. Rhee would use children to do her dirty work. Everybody knows she wants to sell all public schools to corporations. America wants to continue spending money on military budgets and invading foreign countries. America does not want to invest in public education anymore. Common Core, the new teachers evaluations, testing, the newest educational words rigorous, engagement, effective, ineffective and accountability are created to cause problems and destroy public education. Students supporting Rhee better be careful what you ak for. The économy in America will never be strong, jobs are harder and harder to find. Charter schools are in the business of making money when they make enough and close where will you send your child. It is a shame that adults would use children for their own monetary and political purpose. But you will anwser to somebody that you can't lie to because hé knows what is in your heart.